Elvis 5 can be tightly integrated with Enterprise Server 10 to make the assets that are stored in Elvis available in the workflow of Enterprise. This article describes the architecture as well as some of the technical aspects of working with assets within an Enterprise integration. At the heart of the integration sits the Elvis Content Source plug-in. It is installed and configured in Enterprise Server and takes care of all communication between Elvis and Enterprise. The following figure shows an overview of the plug-in architecture. Elvis Server. Manages all files which can be placed on layouts or that can be stored (as a reference) in Dossiers in Enterprise. Such files include images, videos, audio files, documents and so on. Enterprise Server. When a file is accessed through Enterprise (for example by dragging it in Content Station or by placing a file on a layout in InDesign with Smart Connection installed), it retrieves the original file, the file preview, the thumbnail, metadata and versions from Elvis. Likewise, when changes to the metadata of a file is edited in Enterprise, the Content Source plug-in ensures that these changes are also made to the file in Elvis. Elvis Content Source. The Elvis Content Source plug-in for Enterprise is the link between Elvis Server and Enterprise Server. It manages all file operations performed by Enterprise on files stored in Elvis. 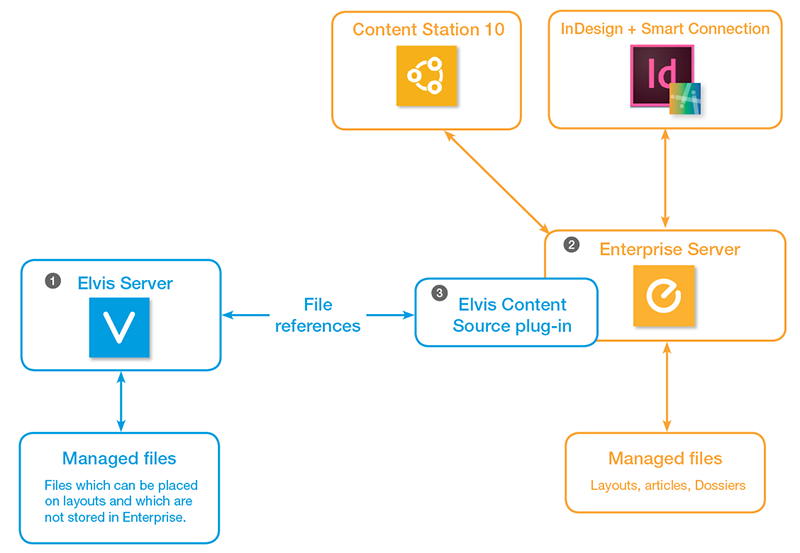 A Content Station user drags an image from Elvis into a Dossier in Enterprise. At this stage, a reference to the file in Elvis is stored in Enterprise. Next, the user decides to open the image from Content Station in Photoshop for editing. Because this requires the original file, it is retrieved from Elvis (together with all the supporting files) and stored on the local system of the user. The metadata of the file is stored in the file in Elvis and simultaneously in the reference in Enterprise. Whenever values in the mapped metadata fields is changed on either the Elvis side or the Enterprise side, these values are synchronized. When the default configuration is used, a file from Elvis can only be used in one Enterprise Server at a time. To use a file in multiple Enterprise Brands, use the 'variant' option as described above. When importing files from Enterprise in Elvis or exporting files from Elvis to Enterprise, the default behavior is that references are created in Enterprise. Should copies be created instead, this can be configured. For more information, see Importing files from Enterprise Server into Elvis 5 and Automatically exporting assets from Elvis 5 to Enterprise - configuration. For a seamless integration between Elvis and Enterprise it is important that all clients use the same user to log in. The user therefore needs to be present in both Elvis Server and Enterprise Server and have the proper permissions assigned. The use of LDAP is advised. For more information, see Integrating Elvis 5 in Enterprise Server 10. 13 December 2016: Added information about the 'variant' option. 13 December 2016: Updated architecture diagram.